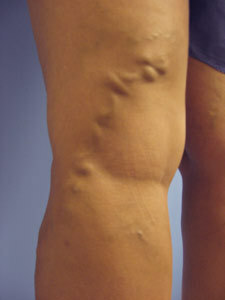 Varicose veins are enlarged, raised veins which can be easily seen on the surface of the legs, particularly when standing for long periods of time. They can be very winding, ropelike, and often dramatically large. They are located deeper than the spider veins and are usually the result of chronic venous insufficiency (CVI) of the great or small saphenous veins, which are some of the larger veins inside of the leg. The end result of CVI is that blood “pools” abnormally in your legs which eventually opens up and enlarges veins in the skin which normally would be tiny in size. They are often associated with spectrum of symptoms including pain, heaviness, burning, or swelling but can also lead to skin changes, including thickening, brown discoloration, and ultimately, ulcerations. The symptoms are exacerbated by prolonged standing and are often progressive throughout the day. Depending on the source of abnormal blood flow to the varicose veins and your particular anatomy, they can be treated with dndovenous laser therapy (EVLT), endovenous radiofrequency ablatation (FastClosure), ambulatory phlebectomy, or ultraound guided foam sclerotherapy, all of which are performed at Middletown Vein and Aesthetic Center.